2DKits is our way to do heavy electronic geeking, allow other people to have fun at a reasonable cost, and keep us from going broke in the process. Currently Dale and Dwayne have several "blinkie" kits for sale. They are small boards running various PIC processors (16F688 and 12F683) to drive flashing patterns on various arrangements of LEDs, some with a push buttons, with communication via the RC-5 IR protocol. Without sounding too immodest, we are probably near the top in terms of expertise regarding these PICs (16F688 and 12F683). Well, that's what you get when you cross years of software engineering design experience, PICs, LEDs, and fun. We've also been known to hold workshops for 200+ people because we think it's fun and we like to see the enjoyment of someone learning to put together a kit for the first time. 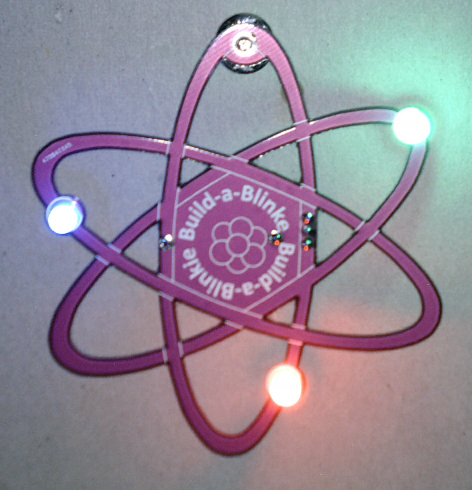 The circuit, software and other technical info are located in our Catalog of Blinkie Kits.